Alice Valfrè experiments with glass, light and digital technologies, creating captivating installations - small dream worlds which the viewers can become part of. Alice is a designer from Torino, Italy, who combines glass and digital technologies in her work. Graduating in 2013 in Design ad Visual Communication from the Politecnico di Torino, Alice worked as a designer and product developer in an Italian high-end jewellery brand until July 2016, before attending a Masters in Glass at Edinburgh College of Art, from where she graduated in September 2017. 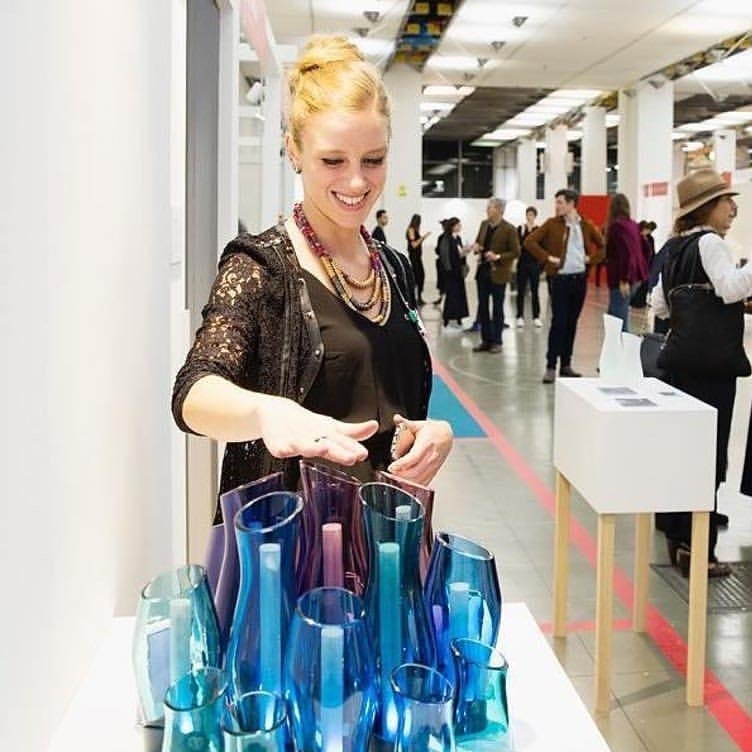 In the first years of her practice as a designer/maker, Alice exhibited her work twice (2012 and 2015) at Paratissima, an exhibition for emerging artists and designers in Torino. In 2016 she exhibited her first interactive lighting project during the 'Colour Code' exhibition, at Cupola Gallery in Sheffield. In November 2017 Alice exhibited her lighting installations at Operae, an independent design event held annually in Torino, and since then has been invited twice to attend the Fuorisalone during the Milan Design Week. Inspired by otherworldly landscapes and dreamy enchanted worlds, Alice’s creations arise feelings of fascination and wonder in the public, generating immersive experiences which the viewer can become part of. Glass becomes a fluid medium through which to materialize light, transforming it into drops and ripples of water, or lively bioluminescent creatures. Digital technologies play a major role in her design process, not only as useful instruments, but more widely as a source of inspiration. Fascinated by the endless possibilities offered by designing in the digital environment - a virtual space, free from the physical laws and constraints of the real world - Alice translates digital aesthetics in original designs, creating unique objects and captivating installations. The interactive light installations created by Alice Valfrè combine digital technologies with hand-crafted glass elements created with traditional techniques. LED strips and matrices, controlled by sensors and Arduino boards, bring the creations to life, offering an immersive experience to the public. Glass, a dynamic and versatile material, materializes light which becomes a key player in the designer’s work: a lively, fluid light that seeks interaction with the public. By controlling the hypnotic dance of bioluminescent pixels, or provoking a shower of droplets of digital light, when contemplating Alice’s work the public becomes part of a unique, dreamy and mysterious experience.